The band was formed in 2000 with the aim of ‘flying the flag’ for The Royal Scots at public, charity and civic events. At that time, it was comprised of serving and former members of the regiment who played the pipes and drums. 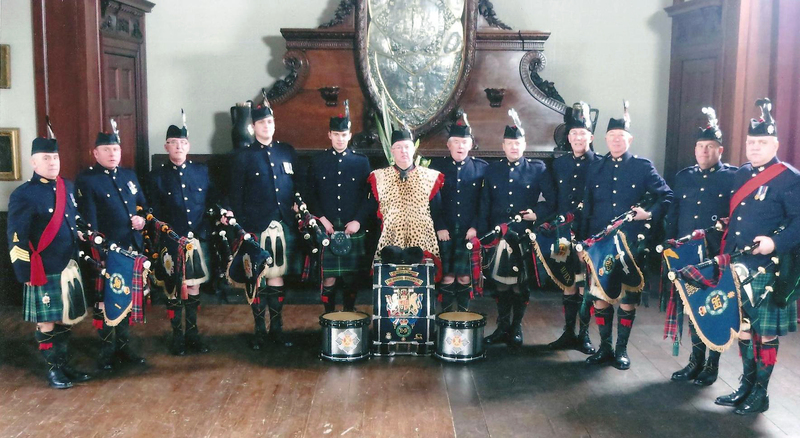 Non-military members were later invited to join, and today the band comprises a mixture of former Royal Scots, other serving and ex- Services members and civilians. . They perform at all kinds of events, from great ceremonies to weddings, birthdays, funerals, social and corporate events. It has also been invited to perform abroad in public and at Military Tattoos in Belgum, Belarus (Russia), Sweden and Italy. In 2014, the band supplied a piper and a drummer to perform in ‘The Drummer & the Drone‘, a film by Craig Coulthard, screened daily at the Edinburgh Art Festival. At midnight on Monday 4 August 2014 – the centenary of the declaration of war on Germany – four of our pipers played ‘The Battle of the Somme’, followed by Colin Scott’s superb rendition of ‘The Flowers of the Forest’. The performance was part of the ‘Forgotten Voices of the Great War‘, a major production based on Max Arthur’s book on the Imperial War Museum’s oral testimonies of the veterans of World War One. The standard band uniform is Argyll Jacket and Hunting Stewart kilt, but it also can appear in our No 1 uniform. The Band is always looking for pipers and drummers, any interested parties can contact us below.